The RAM adapter base includes a 1 diameter rubber ball and inserts directly to the back of Lowrance Elite 4 and Mark-4 Fishfinders. The adapter serves as a quick release mechanism, allowing you to remove or transfer your Fishfinder in seconds. The U in the part number reflects product packaged in poly bag. 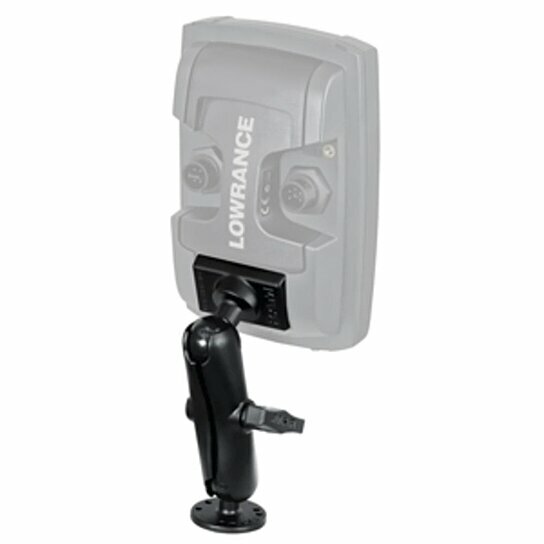 RAM recommends this adapter base for Light Use mounting applications, including light weight Lowrance Elite and Mark Fishfinders. The RAM-B-201U, standard double socket arm, has a socket at both ends that accommodates 1 ball bases. A single spring inside the arm opens the end sockets, allowing you to pivot the ball and socket connection. This socket technology allows for almost infinite adjustment and perfect viewing angles. The (RAM-B-202U) RAM marine grade aluminum base contains a 1 diameter rubber ball connected to a flat 2.5 diameter base. This mount has pre-drilled holes, including the universal AMPS hole pattern.